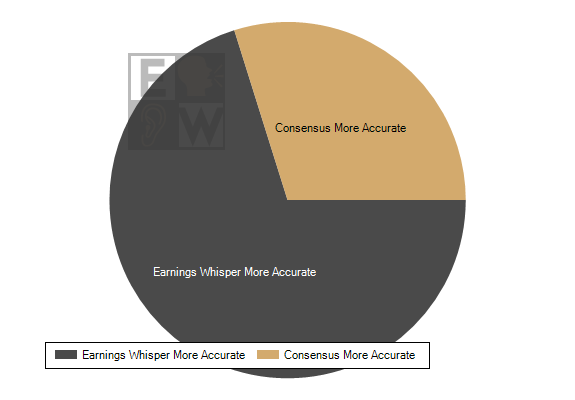 Since 1998, Earnings Whispers has published 98,733 Earnings Whisper numbers and, 71.5% of the time, the Earnings Whisper number was the most accurate published expectation by gathering the true expectations of 11,513 professional analysts - people who actually get paid to tell hedge funds, portfolio managers, and broker clients their projections. At the same time, we've gathered 6,888,413 price and earnings expectations from 668,340 individual investors to identify when, and what stocks, investors are the most bullish and bearish going into the companies' earnings releases. Each week we assess the current environment by first taking top-down view of the market from the perspective of macro economists and market technicians, then we take a look at the top companies scheduled to report earnings - from the perspective of the bottom-up analysts. Measuring a company's results against professional analysts' expectations and the individual investor's sentiment, gives us an indication of which stocks are most likely to outperform the overall market over the next 90 days. When it comes to equities, fundamental trends play a more important role in the performance of the stock than the technical trends. Short interest tends to peak when a stock bottoms - here is a list of stocks that has had some favorable earnings indicators while short interest has climbed to a potential peak.